The Dog Rose is located in the stunning countryside of Romania, around 30km north of Bucharest. The tranquility provides an oasis for 170 dogs who have all been rescued from horrendous situations. Many of the dogs have been found on the side of the road, close to death having been hit by a car or dumped in plastic bags left for dead. The shelter is managed by two amazing vets, Gabrielle and Alice, who have devoted their lives to helping the Romanian strays. In addition to rehoming, Wild at Heart Foundation are working on a longer term goal with the Dog Rose and IAPWA to reduce the stray dog population by neutering dogs in the surrounding villages. Alongside the neutering campaigns we will slowly change the views and perceptions of stray dogs in Romania through education initiatives. The Dog Rose has a wonderful education centre, inspiring the next generation to love and respect animals. Although these dogs are in absolute heaven there are thousands more roaming the streets or stuck in public shelters awaiting their rescue. Please take a look at some of the wonderful dogs we have for adoption. As soon as one dog has been rehomed, there is space for another to be rescued. Wild at Heart Foundation have teamed up with Humane Society International to rehome dogs from the meat trade in China, most recently from The Yulin festival. The Yulin Festival is an annual celebration held in Yulin, Guangxi, China, during the summer solstice in which festival goers eat dog meat. Chinese activists with whom HSI has worked for many years, together with two other groups, negotiated the release of 135 dogs from three facilities in the Yulin suburbs. They captured chilling footage inside one slaughterhouse that kills around 50 dogs every day for human consumption. Wild at Heart Foundation will be assisting HSI in the rehoming of these dogs. Wild at Heart Foundation and Friends of Moldavian Strays (FOMS) have teamed up to deliver Moldova's first neutering campaign which began in February 2018. We are currently neutering 16 dogs a month and hope to run a larger scale neutering project in the future. This project relies on local volunteers to catch, transport and release the stray dogs. Moldova is landlocked, located between Ukraine and Romania and is Europes poorest nation. It is estimated that there are approximately 5-7 thousand stray dogs in Kishinev (Moldovas capital) alone. Moldova has no animal welfare laws and daily life is extremely harsh and dangerous for the dogs on the streets. This vital project will make a small but significant difference in helping to reduce the number of stray dogs suffering on the streets. Wild at Heart Foundation support projects worldwide including right on our doorstep in London. 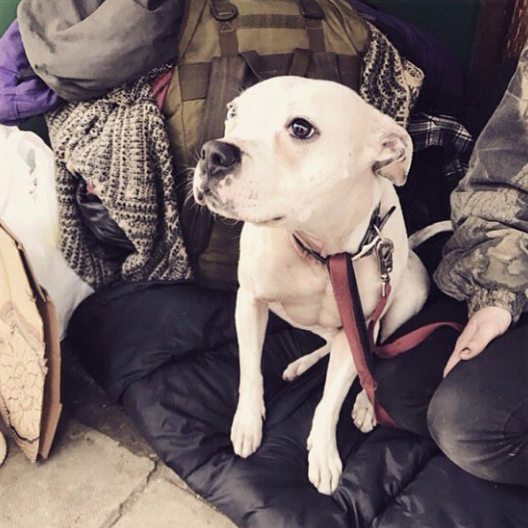 DOTS London (dogs on the streets) is a voluntary run not-for-profit organisation dedicated to the welfare of dogs belonging to the UK’s homeless community. Set up in 2016 by Michelle Clark who had run an outreach programme tending to the needs of the homeless with dogs, she steadily built up a strong rapport and in depth knowledge of their true needs. Via Michelle’s extensive work in this area, the true inspiration for DOTS came in the waggy tailed shape of a very special street dog called Poppy who changed Michelle’s life forever. Poppy’s homeless dad was taken very ill and having heard about Michelle’s work made contact to see if she could help with Poppy’s welfare while he moved into accommodation to try and better his health. Michelle took Poppy on, welcoming her into her family (including numerous other furbabies!) like one of her own. And it was this bond that was formed with Poppy that sparked the desire in Michelle to do even more than she was for the homeless doggy owning community, to provide a more permanent and regular service. Wild at Heart Foundation run campaigns throughout the year to support DOTS with donations of supplies from our followers of adopters and dog loving people. SA Mast is located in the heart of Khayelitsha, Cape Town, the largest and fastest growing township in South Africa. SA Mast is currently responsible for the largest, area specific and goal driven mass animal sterilisation campaign in Africa. SA Mast aims to address the causes and consequences of the over-population of diseased, stray, neglected, abused or dangerous domestic animals in specific areas via the implementation of a free, consistent, extremely focused and goal driven mass animal sterilisation, treatment and education campaign. Wild at Heart Foundation are supporting SA Mast with ongoing neutering campaigns, helping to reduce the number of dogs roaming the streets. Bon Jardin is a Dog Rescue charity located on the outskirts of the central province of Nakhon Nayok, 2 hours north of Bangkok and sits at the foothills of Khao Yai National Park. It is known for its beautiful rivers, waterfalls, National Parks and stunning Buddhist shrines and temples. Agriculturally, the farm has two large rice paddies which produce biannual crops, mango groves and some small fields dedicated to growing seasonal crops. Income generated from these crops help support operational costs for the Dog Rescue and Education & Training facilities. The street dog population in Thailand is spiraling out of control; it is estimated that there are around 8.5 million street dogs in Thailand, of which about 730,000 have been tragically abandoned on the street by their owners. Bangkok Post recently reported that this number will rise to 1 million this year due to a sharp rise in abandoned pets. Since euthanasia is not an option in this largely Buddhist country, the main focus for tackling the exponential population growth is Spay & Neuter. Bon Jardin have invested time and resources to properly survey the local street dog population in Nakhon Nayok and are now pressing ahead with a Temple Spay & Neuter clinic, which aims to help up to 1,000 street dogs over the next 12 months through a vital mobile sterilization and rabies vaccination programme. Wild at Heart Foundation partner with Bon Jardin to help fund this vital clinic which will bring us a step closer in achieving our mission of reducing the worlds 600 million stray dog population. ‘Vusumnotfo’ is a Swazi not-for-profit, community training and support organisation. Vusumnotfo’s vision is to help communities significantly improve their own social, economic and environmental conditions. We feel that their goal fits hand-in-hand with our mission, and because they are focusing on animal welfare in conjunction with communities, the match was perfect. Working with a number of organisations, including SAWS, Waterford and the Vets Association, we have brought together a free clinic and follow-up centre to provide much needed veterinary services, including vaccinations, spays, neuters, worming and general healthcare and training. We want to be create a positive example of how best to care for your animal, in order to break the cycle of mistreatment to animals. We have also set up education sessions for students and staff on how to care for dogs, how to develop a companionable bond, and how to appropriately discipline dogs. Bringing animal care services combined with education to a rural community will help to support care and companionship for animals, promoting the development of empathy in young children. So far, we have funded over 187 sterilisations and educated 4,167 students and 219 staff members. Protect Animals Greece was formed in early 2017 to be the first national charity of Greece to promote animal welfare across the country. Their vision is to create a Greek society in which everyone can benefit when every living being is treated with respect, care and compassion. They work to protect and improve the lives of all animals across Greece to ensure that they live a life free from pain and full of happiness. They do this by changing attitudes and raising awareness, one person at a time. Education and training, impacting animal's welfare and the rest of the society. Influencing policy and law enforcement, so things get done. Wild at Heart Foundation is working with PAG on specific projects that include neutering and education initiatives in Lesvos, as well as acting as to support their fundraising efforts in the UK. Find out more on their Facebook and Instagram feeds. Animals Asia was set up by Jill Robinson MBE in 1998 to promote compassion and respect for all animals and works to bring about long-term change. Animals Asia’s mission is to end the farming of bears for bile in Vietnam and China, provide sanctuary for bears, end the suffering of wild animals in captivity, and end consumption of dogs and cats. Cats and dogs in most parts of Asia are often abandoned and left to subsist on the streets, with many dying due to illness or accidents. Government authorities organise brutal dog-killing campaigns to try to reduce stray dog populations. Stray dogs and cats are also snatched from the streets and pets are stolen and taken to horrific meat markets, where they are sold for human consumption and often suffer a slow, violent death. Wild at Heart Foundation partners with Animals Asia to support their ‘Professor Paws’ innovative programme that sees registered therapy dogs visit schools to teach children to overcome their fear of dogs, learn safety around dogs, responsible pet care and compassion for all animals. On a broader level, the programme is sculpting attitudes to dogs (and all animals) at a young age and teaching children the importance of kindness and compassion. The basic programme consists of four structured one-hour lessons over four weeks, with the children graduating as 'Pet Cadets'. The children also practise their English-speaking and literacy skills with a native English speaker in a fun environment. 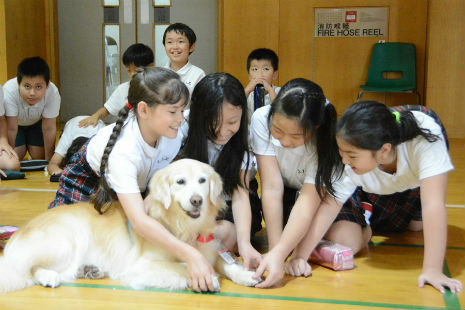 Many of these children have never had the chance to touch a dog before their first Professor Paws class. Often in the first class they are terrified because they have simply had no experience of dogs, or their parents have instilled this fear in them, telling them not to touch dogs because they are dirty and dangerous. To find out more about Animals Asia visit their website. IAPWA (International Aid for the Protection & Welfare of Animals) is a UK registered animal welfare charity dedicated to creating a better future for animals in need. Thier work is funded entirely by the generosity of animal lovers worldwide. IAPWA's first project was based in Kota Kinabalu, Borneo - home to approximately 10,000 stray dogs. In many countries around the world, as well as the challenges the stray dogs face every day, inhumane methods of dog population control are also practiced. In 2009 IAPWA made it their mission to change the future for dogs in this region and following four years of negotiations, they were awarded management of the city dog pound to run a humane programme to replace the previous methods. This was a huge success for the stray dogs and an important step forward to improve their lives. In November 2015 IAPWA received fantastic news that as a result of negotiations held by IAPWA and other NGO's in Borneo, it is now prohibited for cats and dogs to be used for human consumption, animal fighting has been made illegal and there are now increased penalties for animal cruelty. This is another significant step forward. Wild at Heart Foundation are supporting IAPWA with ongoing neutering campaigns & education initiatives in Borneo and we hope that together we can reduce the 10,000 stray dogs. Wild at Heart Foundation have been working in Lesvos since 2016 where we support small scale shelters with rehoming to the UK and veterinary bills for the dogs in their care. In May 2017 our team put together a door to door survey to further understand the plight of stray dogs and the views of the community. Sadly many Greek people believe that neutering animals is unnatural and harmful to them, and oppose neutering very strongly, this causes thousands and thousands of unwanted animals to be born every single day. We aim to work together with local vets in the municipality of Mitilini to provide spay and neuter services to the stray and owned dogs on the island changing culture and education in the community. Wild at Heart Foundation have been working in Puerto Rico since May 2016 when we supported the rescue and rehabilitation of Canelo who was found deserted in the middle of a forest in 90 degree heat. We work closely with the Humane Society PR providing them with funding to open three sterilisation clinics a month for low income families including a pit-bull only clinic. In September 2017 after Hurricane Maria ripped the island to pieces our team flew out to Puerto Rico to help the thousands of animals left abandoned on the island in dire conditions. Many animals were left without homes, adding to an already troubling stray animal overpopulation problem. In March 2018 we joined forces with with ViDAS is a group comprised of veterinarians, veterinary students, technicians, and animal–loving volunteers to hold our first mass sterilisation programme on the island. We successfully sterilised over 1,000 animals in just six days. Since our March clinic Wild at Heart Foundation and ViDAS have partnered with the Humane Society US and a coalition of organisations to provide spay/neuter services to the pets of Puerto Rico. Over the next 18 months we will be offering free sterilization services to help the people of Puerto Rico keep their pets safe and prevent unwanted litters. Our aim is to neuter 20,000 animals by May 2019! Anca is a vet and somehow manages to find time to care for many rescue dogs that come from the streets and shelters in Bucharest on top of her full time job. We support Anca with a monthly neutering campaign for strays in her local area and provide homes for the dogs she rescues, paying for the transport and expenses to get them to their new families. Romania suffers terribly with a very large stray dog population. The problem began back in the '80's when the country aimed to become industrialised and people were forced into cities which lead to small houses being destroyed, and in their place, huge apartment blocks were built. There were too many people in the city for the number of homes to hold, forcing families to share with one another. It was at this point that any pets that had been part of the family were abandoned onto the streets of Romania due to the lack of space available. Before long, the vast amount of strays were reproducing at an extremely fast pace, filling the streets with homeless dogs. For the past 20 years the Romanian strays have been subject to extreme neglect in order to try and eradicate the problem. Whilst the country claim that their methods of lowering the numbers should be classed as 'human slaughter', dogs have been reported to be shot, poisoned, starved, beaten and even burnt to death. The act of slaughtering these dogs is now seen as a business for some, who earn money per dog, but in actual fact, this method will not stop the problem. It should be understood that the problem will only begin to improve once a steralisation project can be established and through the means of educating the public. Anca is of the minority who fight for the wellbeing of the Romanian strays and she does an incredible job considering she does everything from her own home, with no proper dog shelter or systematic rehoming programme. Our Foundation will continue to support her to the best of our ability.